So how does it feel to be a hero? Quite powerful, of course! First, a photographer places you on the mark, and tells you to hold out your hands as if you were holding fire. So there’s a little acting, which was no problem. The photographer is fantastic, as I have never liked a picture before the 37th take. The pic is texted and emailed to you in about 5 minutes, and also put up on one of the giant JumboTrons (see image gallery). Next you get greeted by an employee of Renautus, who explains that they want to assess your EVO abilities, and lets you know what to do when you get in there. I enter the room and raise my arms to the side for a scan, and am put through a series of tests evaluating my sudden pyro-kinesis ability. The screen gets fuzzy and Hero_Truther takes over the feed, warning you. You must escape the danger! I obviously have what it takes. Do you? 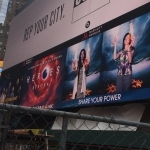 So if you are in the NYC area, head over to Times Square today or tomorrow to have your own Heroes Reborn experience! Heroes Reborn premieres September 24th, on NBC. Experience: The public can become a hero and have a photo taken with a ball of animated fire in their hands. Those photos will be streamed to the digital billboard and shared via social media. 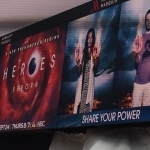 Also, a 4-D interactive experience will allow passersby to enter the world of “Heroes Reborn” and access their own pyro-kinesis abilities. Through a multi-sensory experience of interactive visuals and kinetic effects, fans will use their power with fire to escape a dangerous scenario.